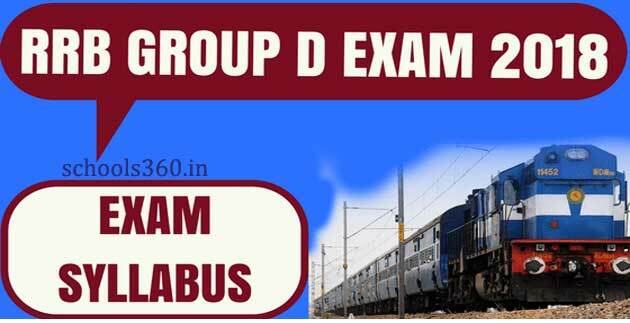 Railway Group D Syllabus 2019 PDF: Railway Recruitment Board announced the RRB Group D Posts for the interested candidates. The candidates who applied for the Railway Group D Exams are able to check the RRB Group D Syllabus as well as exam Pattern from here. The RRB Group D exam dates will be announced soon. As soon as the dates announced from now you can start the Railway Group D exam preparation by using the Railway Group D Syllabus & exam Pattern from this web page. A huge number of vacancies are there in the RRB Group D Recruitment. So the RRB is going to fill those vacancies for the eligible candidates. Here we presented the complete details of Railway Group D Syllabus PDF 2018. Read the following article. Hello aspirants are you applied for the Railway Group D Recruitment 2018? If yes then make sure you are on right path. The candidates who have applied for this post are able to check the Railway Group D Exam pattern from. The RRB Group D Exam consists of 100 marks. The paper divides in 4 sections. The railway Group D paper covers the topics like GK, General Science, Reasoning, and Arithmetic Ability. The candidates who are getting worried about the exam can check the RRB Group D Exam pattern in the table form below. In this article we are going to discuss about Railway Group D Syllabus 2018. The syllabus is very important and helpful for the applied candidates. Candidates download the Railway Group D Syllabus for the free of cost. The candidates who want the syllabus and who are interested to do job are able to download the Railway Group D Syllabus from the article given below.